Quantitative Value is an investing strategy which selects for investment the highest-quality cheapest stocks using state-of-the-art computer algorithm. Our implementation of Quantitative Value has generated returns of nearly 20% per year* on average, with relatively low volatility, and low asset turnover. Follow the following guidelines to construct your own version of Quantitative Value portfolio using the Quantitative Value Screen. Set the TEV/EBIT Rank Slider to 0-25. Set the Market Cap Slider according to your preferences – use the guidelines below. For example, to limit market cap to $200M and up, set the left edge of the slider to 200 and the right edge all the way to the right. Decide on the number of stocks you wish to hold in your portfolio. Use our guidelines below. Sort the stocks of the Quantitative Value Screener based on the Quality Rank (a higher rank is better). Buy the stocks with the highest quality rank. Every one year and a day (to avoid short-term taxation), you will need to replace some stocks in your portfolio. Use the rules below to determine which stocks should be sold and which should be held. Make sure that the Market Cap Slider is wide open and not restricted. Set the Quality Rank Slider to 50-100. Set the TEV/EBIT Rank Slider to 0-40. Sell the stocks with a Quality Rank of less than 50 OR TEV/EBIT Rank of more than 40. Those stocks will not appear in the screener results. Tip: you may use the ticker search box to search for your holding. If the ticker exists in the screener results, keep it. If the ticker does not exist in the results, sell it. Determine the $ amount to invest in each new stock position. New positions should equal the cash which was freed from selling the positions per the instructions above, divided by the number of positions which were sold. Set the Market Cap Slider according to your preferences. See guidlines below on how to determine the Market Cap limits. The market cap limit and the total number of stock holdings in a portfolio – affect the portfolio’s behavior and expected performance. There is no one rule fits all. Different investors with different temperaments will have different choices. The following tables provide a summary of the QV model for various market cap limits and the number of stock holdings. As a general rule, the lower the market cap limit, i.e., smaller stocks are allowed in the portfolio, the better the portfolio’s performance. The phenomenon of small-cap stocks delivering higher returns than large-cap stocks has been researched extensively. Our test results comply. As for the number of holdings, we did not find any predictable rule. In some cases, higher diversification resulted in better returns, and in other cases did not. The sweet spot seems to be around ~30 stock holdings. Combining a Value portfolio and a Momentum portfolio is a desirable path to reduce overall volatility and increase risk-adjusted returns. In such cases, we think that the sweet spot is constructing a 30-stock value portfolio (comprising 60% of the total funds) and a 20-stock momentum portfolio (comprising 40% of the total funds). Ambitious investors who want to maximize their return potential will choose the settings that provide the highest average annual returns. Such investors are willing to invest in microcaps (stocks with a market cap as low as $30M), albeit the lower liquidity and higher transaction costs. The portfolio that suits those goals in portfolio number (2). This portfolio will include micro-caps starting from $30M market cap and have 30 stock holdings. Conservative investors or their money managers may wish to avoid microcaps and even small caps due to their lower liquidity and higher transaction costs. Such investors may want to reduce the volatility of the portfolio as much as possible, and even have a higher correlation to the benchmark. Those measures may help investors to weather tougher periods. They may choose portfolio number (8), which is comprised of 30 stocks with a market cap of $2000M or more. Most investors will seek a balance between low volatility and high return potential. Portfolio (5) may suit their needs. 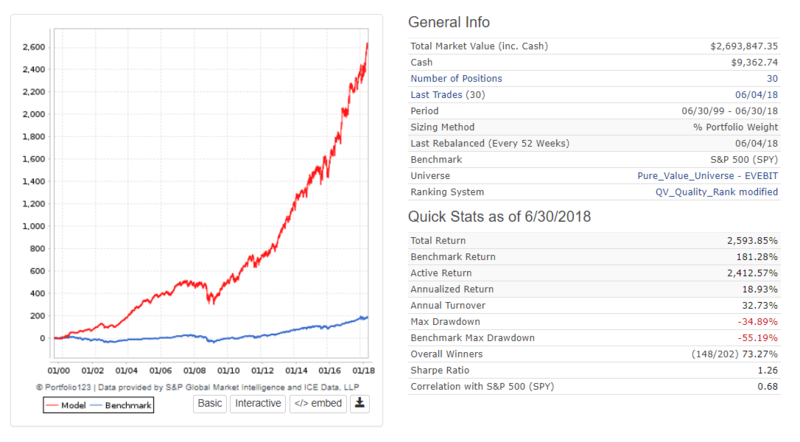 Over a period of 19 years, from June 30th, 1999 to June 30th, 2018, $100,000 invested in the portfolio has increased to $2,693,847. In comparison, the same amount invested in the S&P 500 has grown only to $281,000. The portfolio gained 18.93% per annum on average, vs. the S&P 500 with 5.59%. Volatility over the 19 years period was lower, at 13.18% vs. 14.37% for the S&P. Max drawdown over that period was a mere -34.89% vs. the S&P 500 drawdown of -55%. The Sharpe ratio of the portfolio, at 1.26 is not only higher than the markets but also higher than many quantitative strategies we are familiar with. 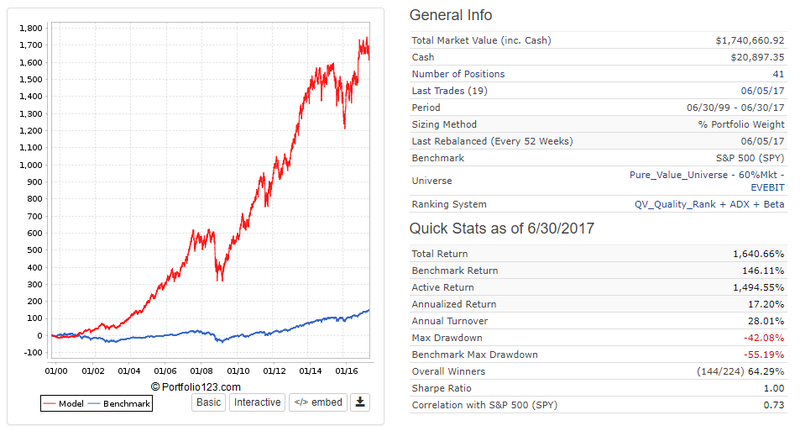 The last three years of the portfolio were also good for the QV portfolio. It had returned 69.81%, almost 30% more than the market. The QV portfolio’s outperformance in a time where Value Investing, in general, has underperformed Growth Investing, is a testament to its merits. We believe that the portfolio will shine when Value Investing picks up the lead again. We think that NOW may be one of the better times to invest in Value strategies. An investment in a QV portfolio, or any other quantitative portfolio for that matter, requires discipline and the right temperament. By definition, the portfolio behaves differently than the market. It does not beat the market every year. It may lag the market for two and even three years in a row, as happened in 2014 and 2015. This exact characteristic prevents short-term oriented individual and institutional investors from investing in such market-beating strategies and creates the opportunity for us. It works because it doesn’t always work.